Elsa Gidlow, born 29 December, 1898 in Hull, Yorkshire, England - died 1986 was a Canadian poet. 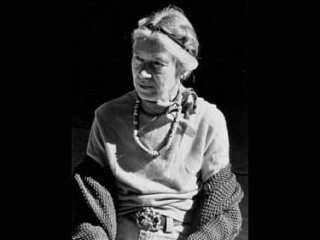 Elsa Gidlow was the first Canadian poet of the twentieth century to write from an openly lesbian perspective. Writing from the heart, and untouched by the poets of the day, her verse lacks the defensiveness often exhibited by other gay and lesbian poets. One of seven children, Elsa Gidlow was born in Hull, Yorkshire, in December 1898 into a middle-class family. When she was six years old, her free-thinking parents moved to rural Quebec, where she grew up in a poor French-Canadian village. Her mother was an avid reader and it was her awareness of music and poetry that made young Elsa aware of such a world and of her own desire to find it. On the other hand, her hard-drinking, ambitious father found Elsa's interest in poetry impractical. Elsa was a lonely child who early in life developed a poetic fantasy life and soon recognized the "need to voice the poetry seething in me." When she was 16, the family moved to Montreal, where Gidlow discovered the library and bookshops. Her very first allowance went to the purchase of a collection of Samuel Taylor Coleridge's poetry. She took courses at McGill College and discovered the works of Baudelaire, Rimaud, and other liberated poets of the time. She was influenced by the classic literature of India. Of her being different, Gidlow said: "In a land of apples, I am faithful to oranges." While she always knew she was different, she did not attribute that difference solely to her lesbianism--she felt she was set apart from others because she was a writer. To meet more writers, Gidlow devised a clever scheme. She sent a letter under a pseudonym to a Montreal newspaper enquiring of the existence of a literary group. Under her own name, she sent a reply to her own query saying there was no such organization but "one is in the process of being formed." She included her name and address. Happily, she received quite a few responses which resulted in the formation of a bohemian literary group and the publication of a "little magazine" which eventually included much gay material. Through the literary group, she met a young man who was gay. He introduced her to the work of Sappho. Gidlow knew she was not attracted to men, and at just 18, Sappho became her role model. Adventure had always seemed to Gidlow to be the prerogative of men, and the role of the non-heterosexual artist--in her case a poet--in the early 1920s was unexplored territory, her "adventure" as it was. As a lesbian in the 1920s, one of the greatest challenges facing Gidlow was finding other lesbians. It was a lonely time, during which she knew no one else like herself. But it was not just the difference in sexual orientation that accounted for the isolation Gidlow felt. It was the poet in her that also separated her from others who were not poets, be they heterosexual or homosexual. Although she fell passionately in love with a friend when she was 16, the friend never knew and there was never any question of a lesbian relationship between the two young women. A few years later she met a woman about 12 years her senior. "I felt extremely drawn to her," said Gidlow. The two shared a kiss that ignited incredible flames in Gidlow, but the other woman was heterosexual. Even so, the unconsummated relationship lasted for almost three years. She finally met Violet Henry-Anderson who gave her her first love experience. Their relationship lasted 13 years, until Violet's death. Although there was no formal commitment, the two were virtually monogamous for the duration of the relationship. A six-year relationship with a woman six years her junior followed. By that time she was nearing 40, and despite meaningful relationships and countless wonderful friends, Gidlow felt that the aloneness she experienced as a young girl never really left her. She was happy with friends, but least alone with nature. Gidlow had been earning her own living since she was 16. She left Canada for New York to further her writing career when she was 21. When she arrived there, she sent a letter to Frank Harris, editor of Pearson's magazine enclosing some of her poetry and reviews. He hired her first as poetry editor, later as associate editor of Pearson's. She left Pearson's in 1926 to move to San Francisco where she was an editor then freelance writer for the remainder of her life. Her first book of poetry, On a Grey Thread, a book of unreserved lesbian love verse, was published in 1923. She was "too ignorant and too courageous to know better" about producing so controversial a book. Throughout her life, Gidlow was commited to fighting injustice. That commitment made her a visible and easy target in the early 1950s when the California Un-American Activities Committee was hunting for communists--which "I was not," said Gidlow. Just the same, the Tenney Committee accused her and her career as a freelancer and a journalist was threatened. However, as she ever had, Gidlow continued to use poetry to express the deepest emotions of her inner self. By the time she died in 1986, Gidlow had to her credit a sizable body of work, including the poetry collections Sapphic Songs (1976) and Moods of Eros (1970), Ask No Man Pardon (1975), a short philosophical treatise on the importance and place of lesbianism in the larger culture, and her frank, sensitive autobiography, Elsa: I Come With My Songs (1986). View the full website biography of Elsa Gidlow.